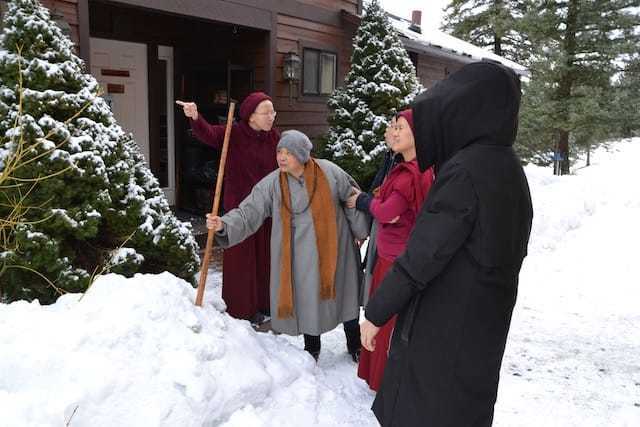 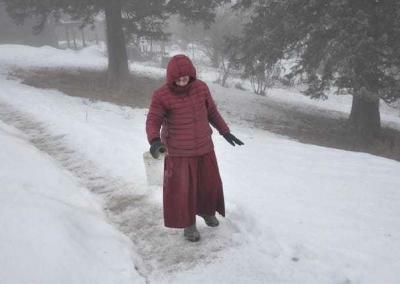 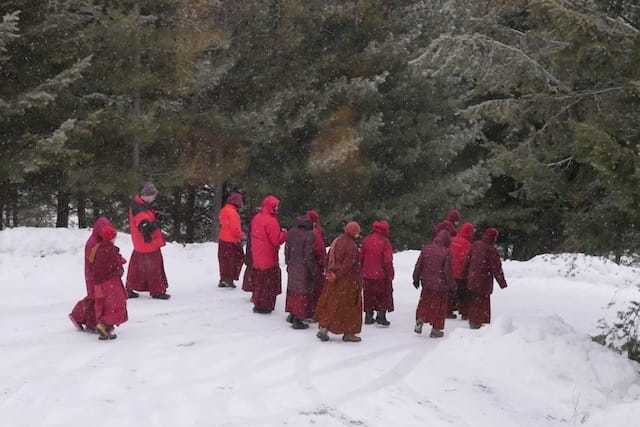 Winter of 2018 saw a first for Western Buddhist nuns. 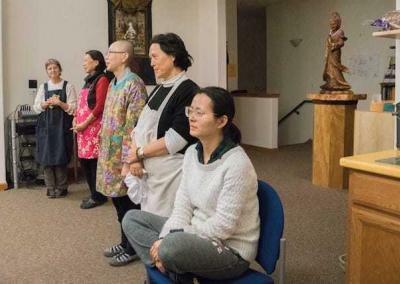 Living Vinaya n the West gathered 49 nuns to study the Bhikshuni Vinaya with Taiwanese Vinaya Master Venerable Wuyin. 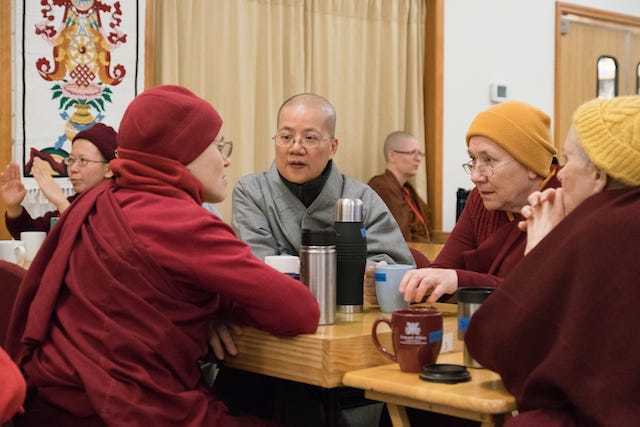 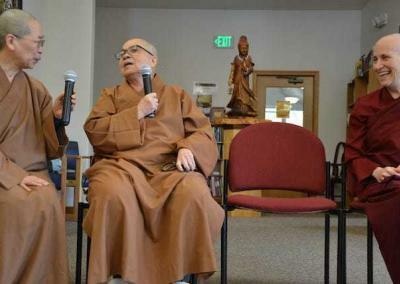 For nearly three weeks, nuns of three Buddhist traditions—Chinese Mahayana, Tibetan, and Theravada—learned, lived, discussed and practiced together in community with other nuns. 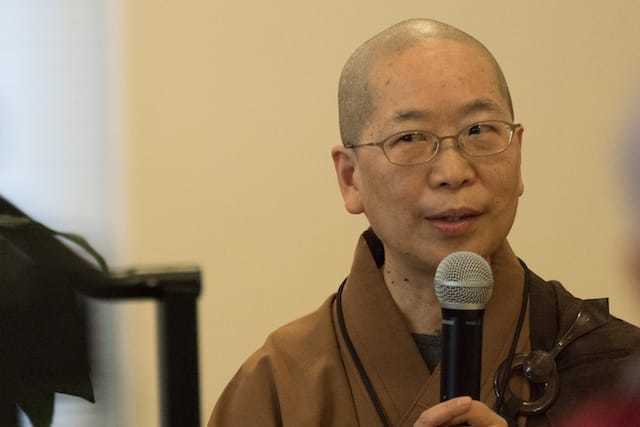 Guided by the remarkable master, Venerable Bhiksuni Wuyin and six of her nuns from Luminary International Buddhist Society—along with teachings from Ven. 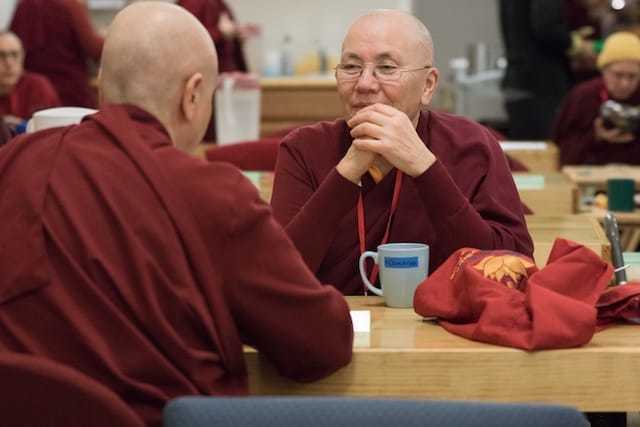 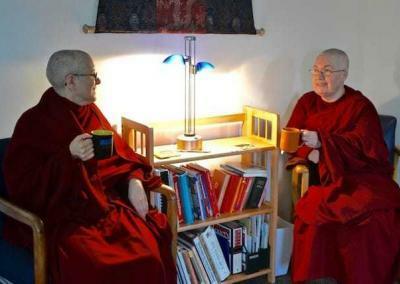 Thubten Chodron—we shared a lived experience of Buddha’s guidelines for nuns living together in harmonious spiritual community. 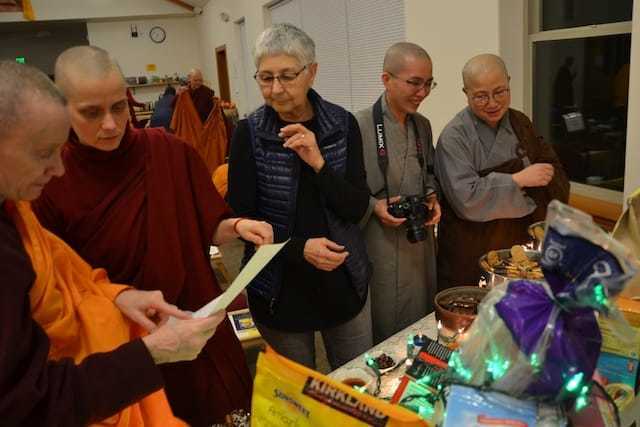 A rare and precious event, Living Vinaya in the West watered the seeds for communities of fully ordained nuns to flourish in the West and the world. 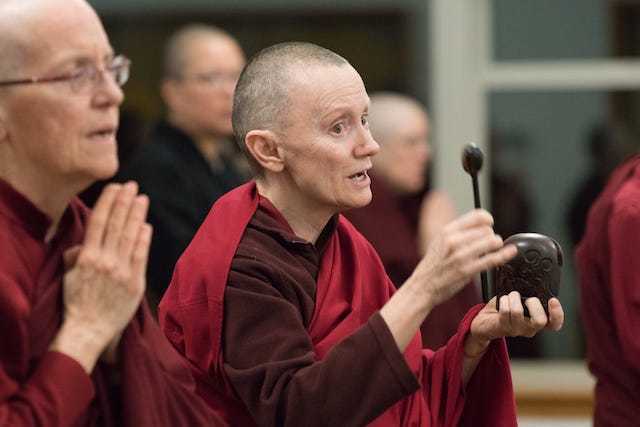 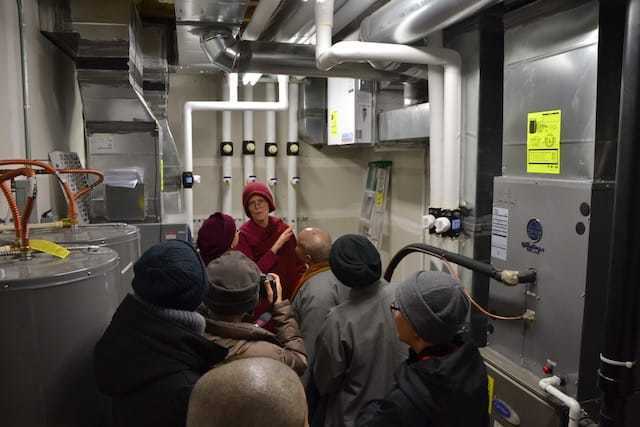 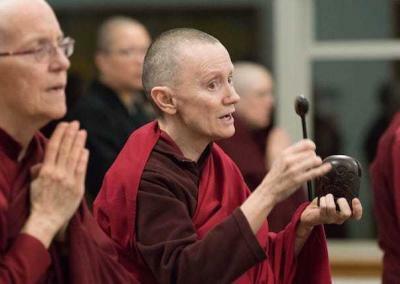 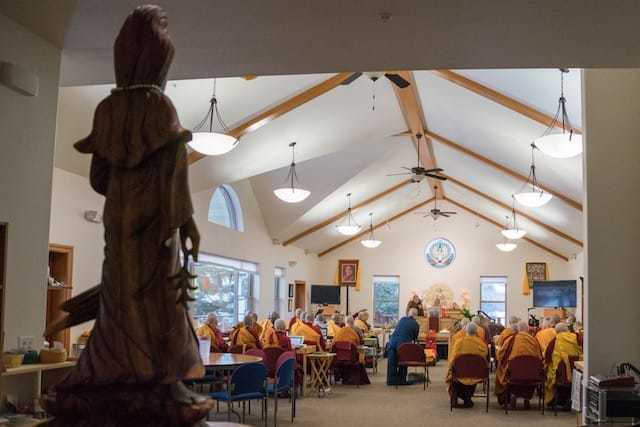 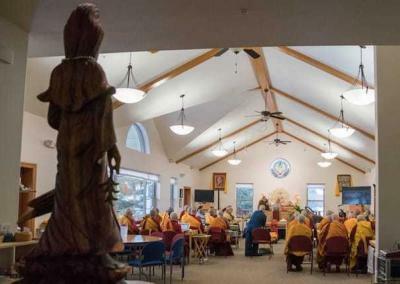 An important moment for American Buddhism took place at Sravasti Abbey from January 22 to February 8, 2018, when 49 nuns gathered for“Living Vinaya in the West.” The 17-day course was an experience in learning and living the Vinaya—the monastic ethical code that includes advice the Buddha gave 2500 years ago to guide, govern, and support harmonious monastic communities. 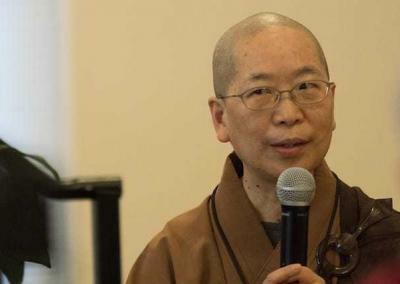 Venerable Bhikshuni Master Wuyin, abbess and president of Luminary International Buddhist Society (LIBS) and Abbess of Luminary Temple in Taiwan, was the guest teacher. 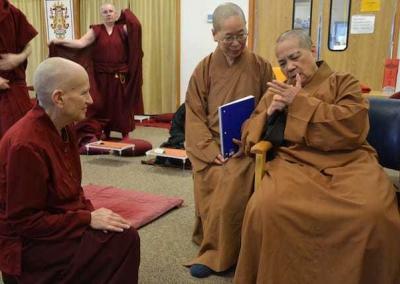 She was supported by six bhikshunis (fully ordained nuns) from her community who served as instructors and translators. 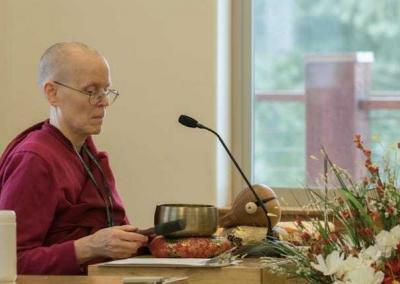 Sravasti Abbey founder and abbess Bhikshuni Thubten Chodron also taught from her experience in establishing the Vinaya in an American monastery. 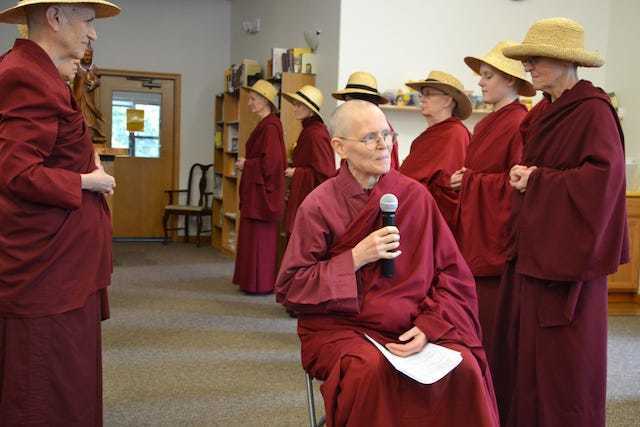 Most participants were nuns practicing in the Tibetan Buddhist tradition. 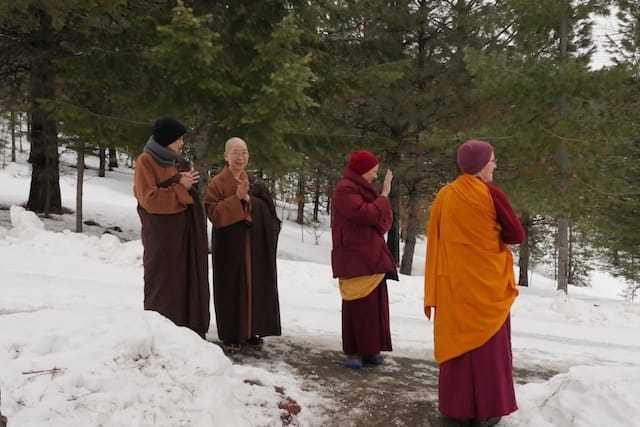 We were also joined by three nuns practicing in the Chinese Mahayana tradition and three nuns practicing in the Theravada tradition. 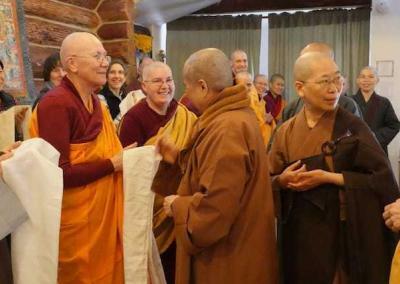 Participants came from nine different countries in North and South America, Asia, Europe, and Australia. 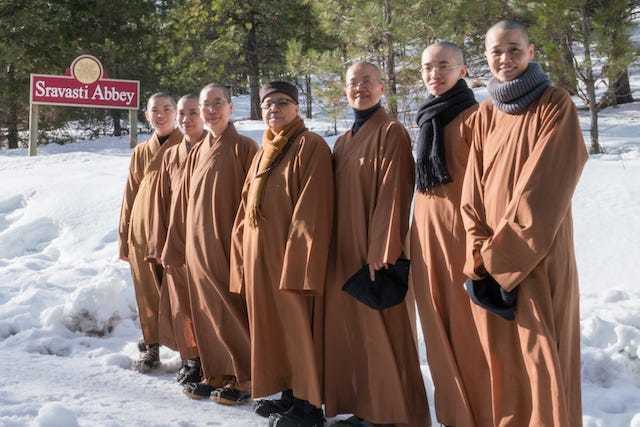 About half do not live in a monastic community, and several others are in the early stages of founding nuns’ communities. 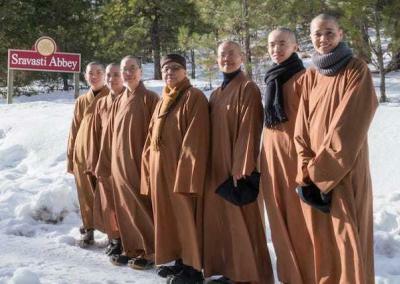 We bonded as a group quickly, with joy and respect. 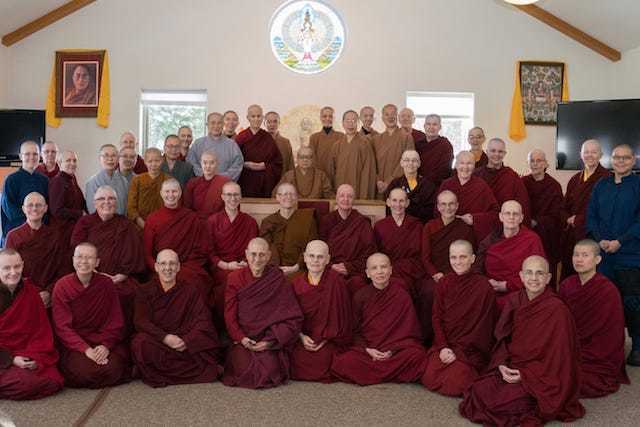 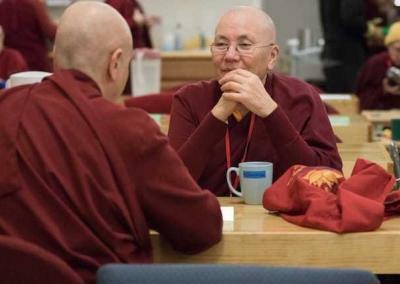 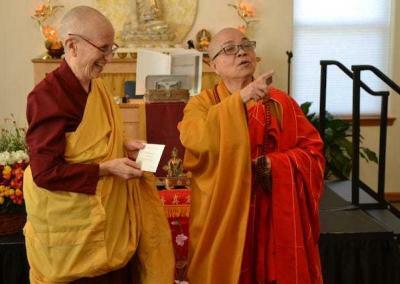 Laughter, sincerity, transparency, thoughtfulness, and discipline co-existed amicably within this harmonious sangha(monastic community). 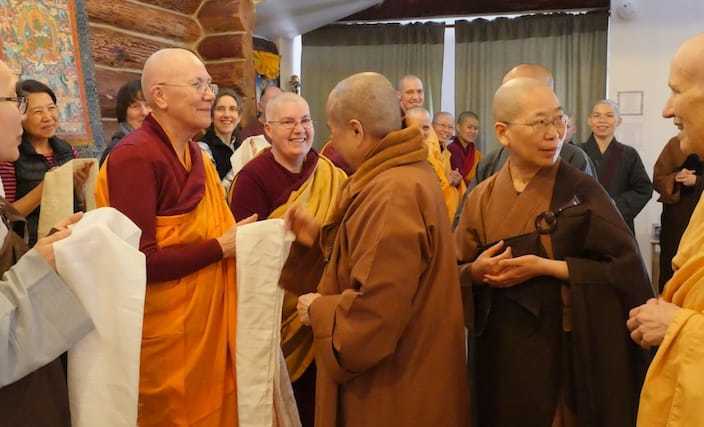 Venerable Chodron first met Venerable Master Wuyin in 1995 when she traveled to Taiwan to request her to teach Vinaya for “Life as a Western Buddhist Nun,” the first education program for Western (and Tibetan) nuns, held in Bodh Gaya, India. 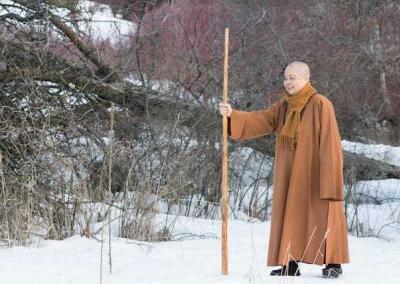 Venerable Master Wuyin’s teachings from that course were later edited and published as Choosing Simplicity, a practical commentary on the bhiksuni precepts. 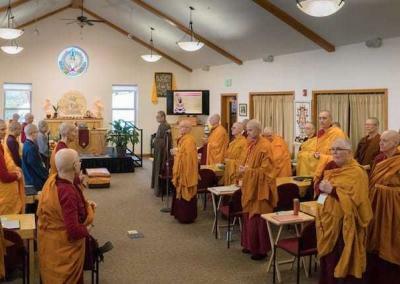 The aspiration for a follow-up course began there. 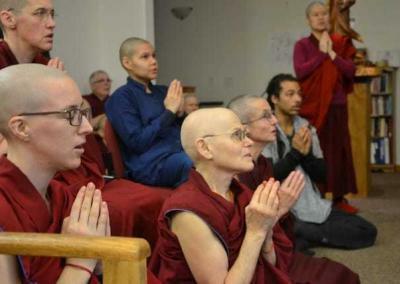 Twenty-two years later, “Living Vinaya in the West” came to fruition, and like its predecessor, it was a first. 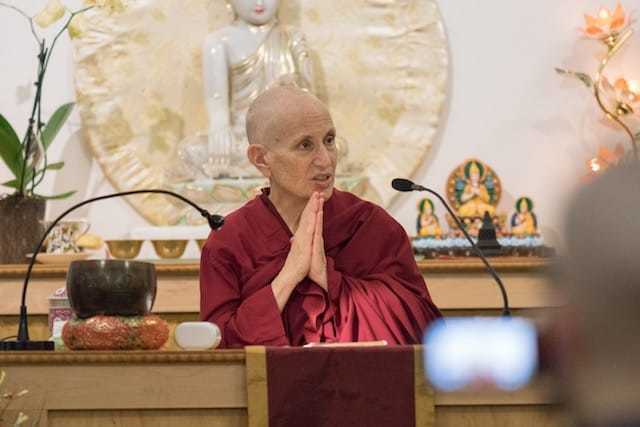 “Living Vinaya in the West” was historic in several ways. 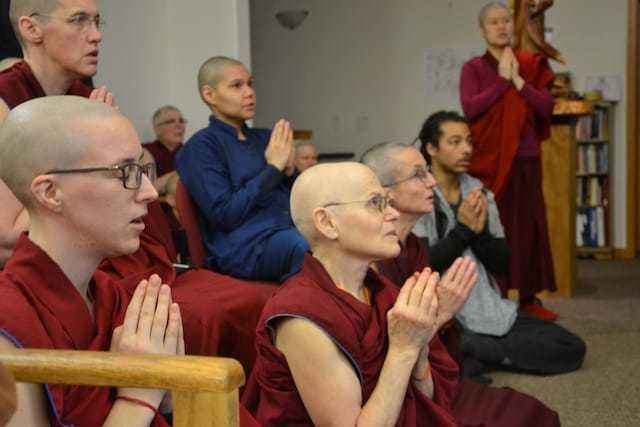 It is likely the first such Vinaya training offered in the United States for Western nuns. 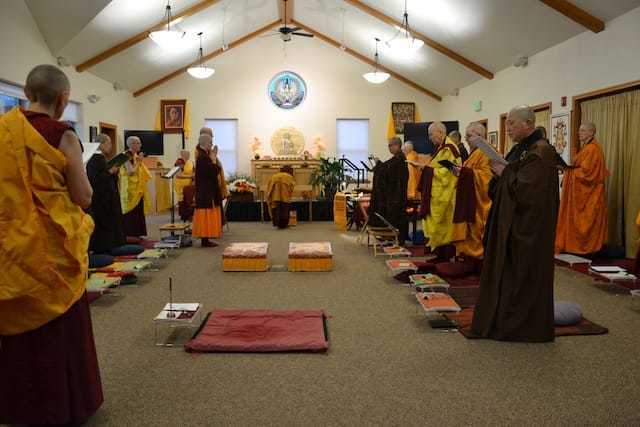 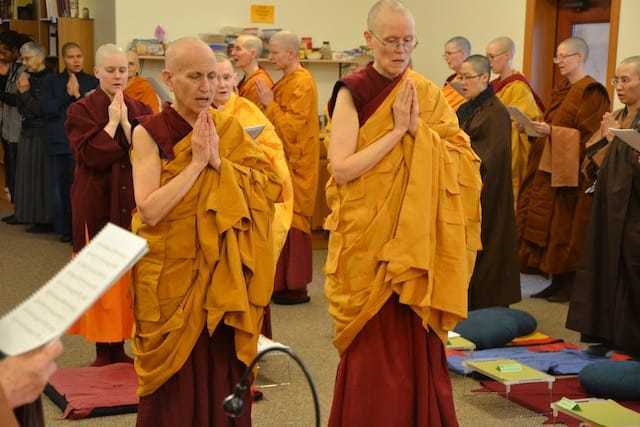 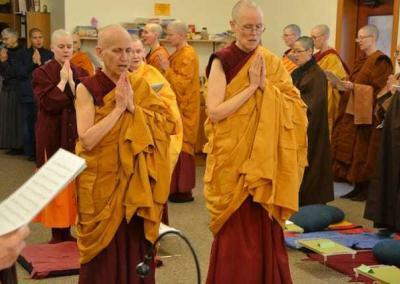 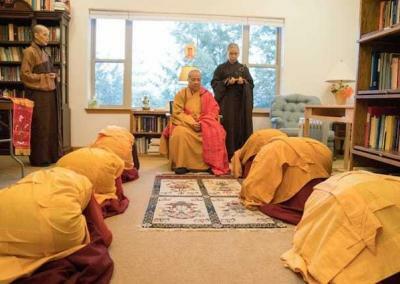 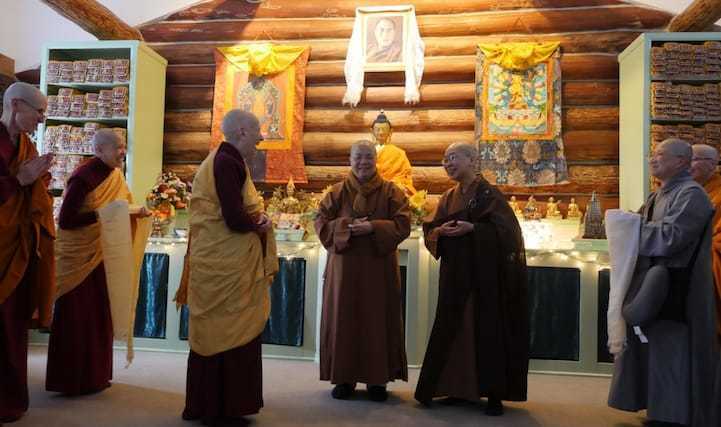 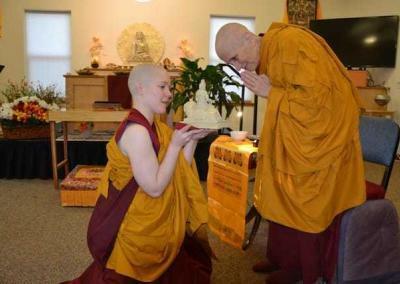 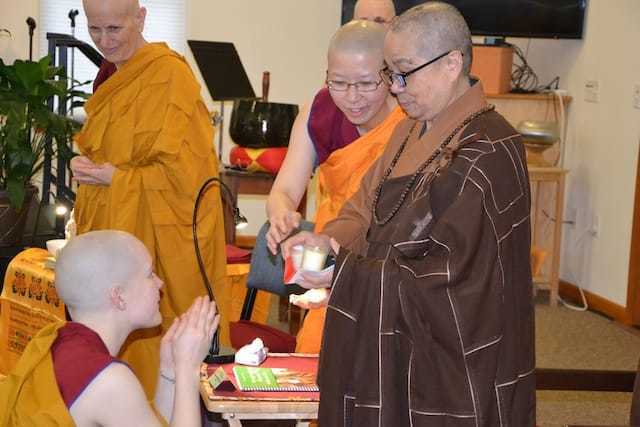 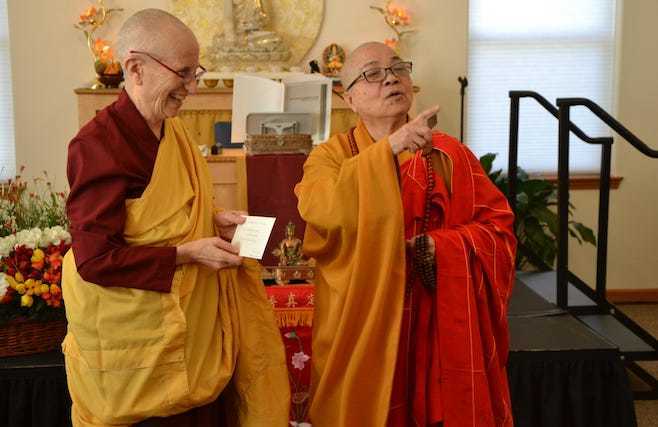 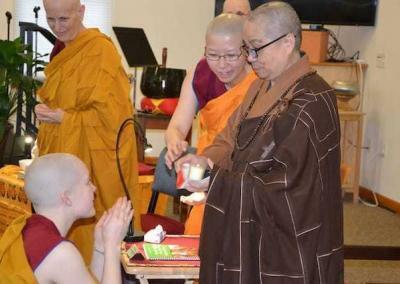 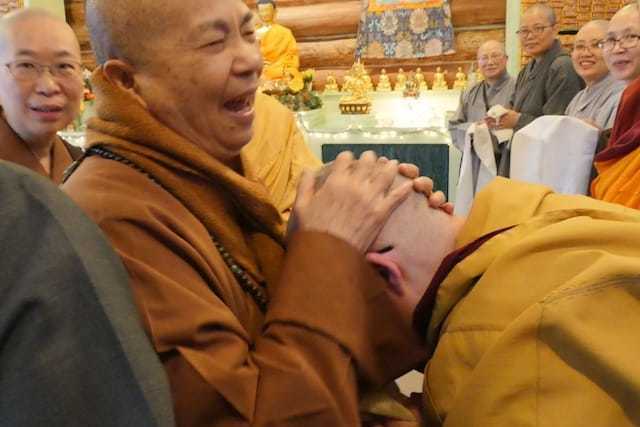 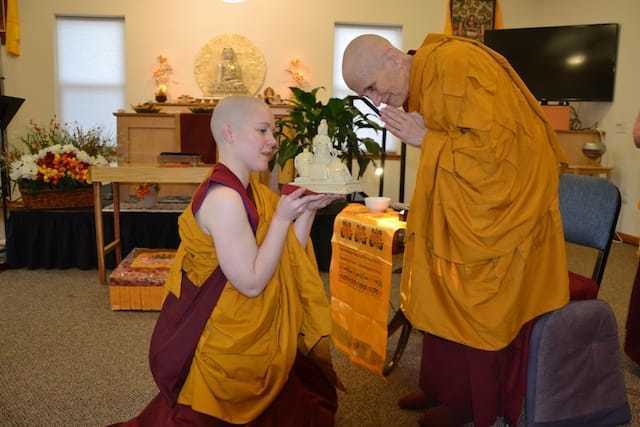 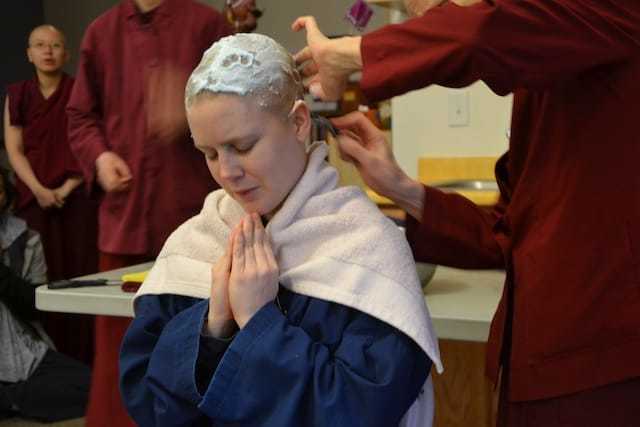 In addition, it featured the first ordination of a novice nun (who received the sramanera and siksamana precepts) to be conducted by an all-Western, English-speaking sangha in the Dharmaguptaka Vinaya as practiced at Sravasti Abbey. 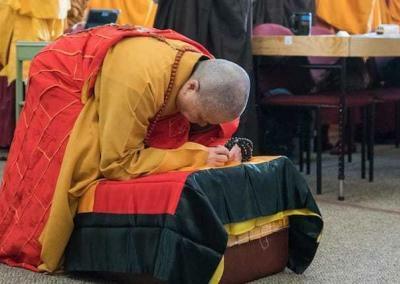 Previous ordinations at the Abbey have included the support of senior monastics from the Chinese Buddhist tradition. 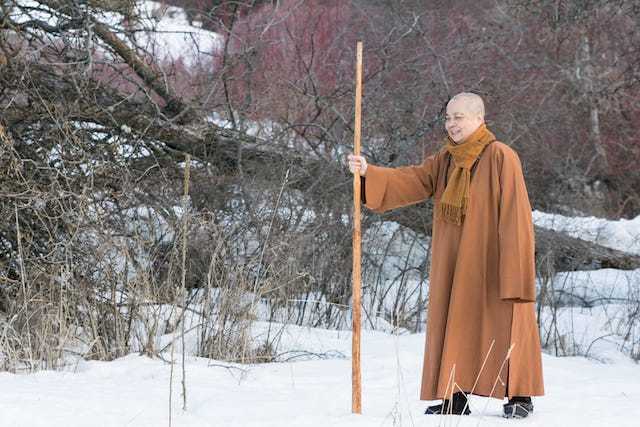 Venerable Master Wuyin has been a Buddhist nun for over sixty years. 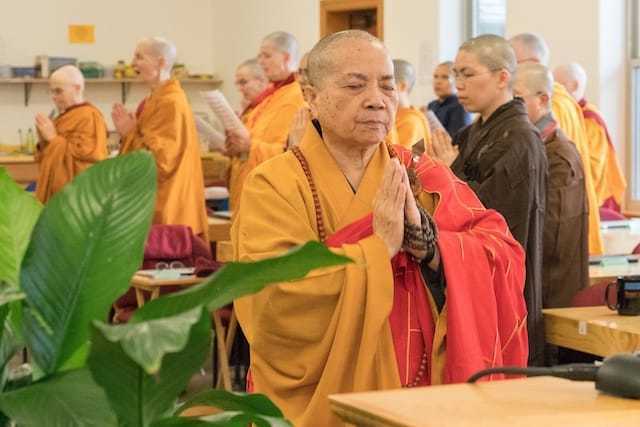 She has dedicated her life to improving the status of fully ordained nuns, first in her native Taiwan, and now around the world. 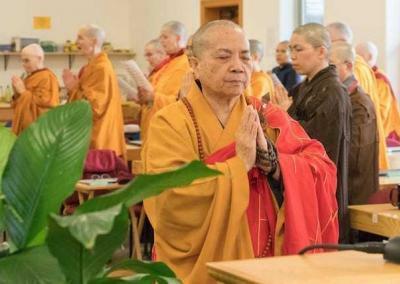 At the age of 77, Master Wuyin said she came halfway around the world specifically to teach this course at Sravasti Abbey. 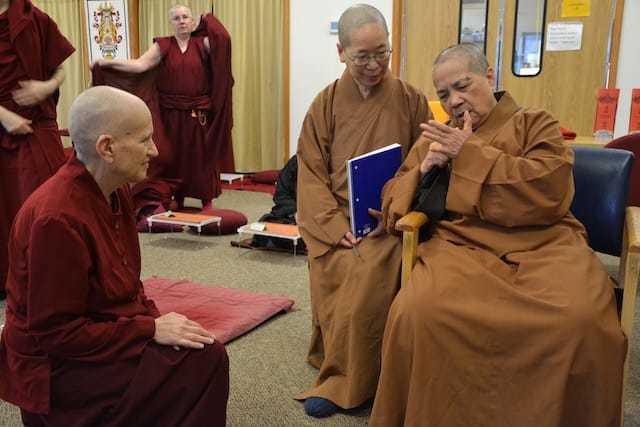 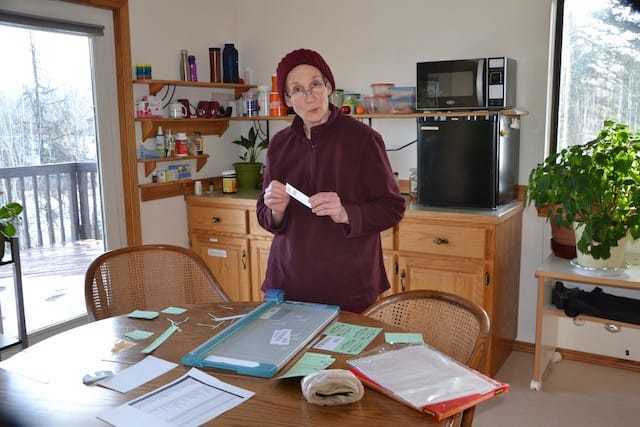 She wanted to observe and support the Abbey’s growing bhiksuni sangha and to train and inspire nuns from other places to establish monasteries themselves. 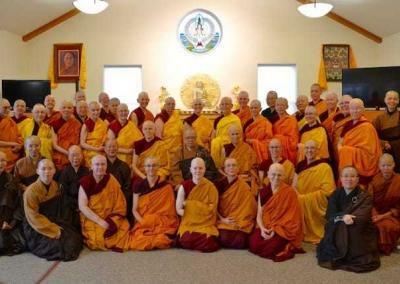 Monastic communities are essential for the long life of the Dharma. 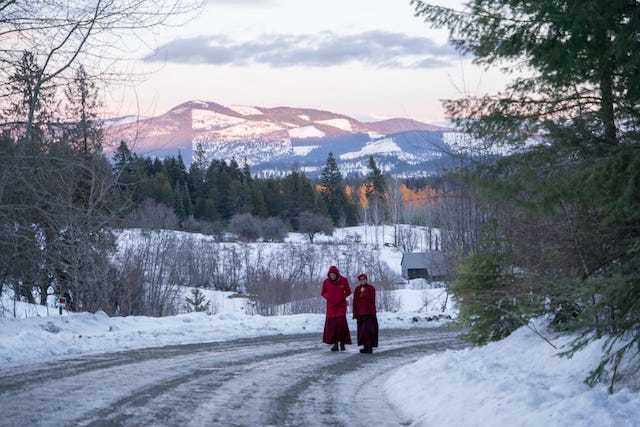 The Buddha stated that where a community of four or more fully ordained monks or nuns practice the Vinaya, his teachings would live long in the world. 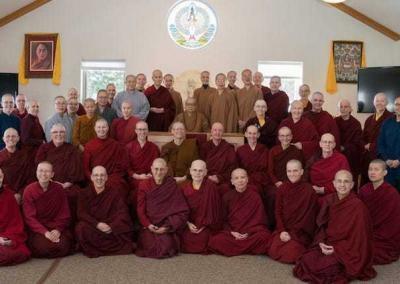 Sravasti Abbey was founded on that basis. 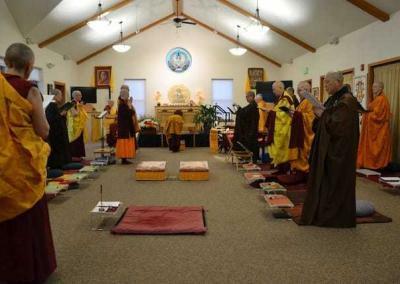 Buddhism is still new to the USA and the Dharma teachings are extensive. 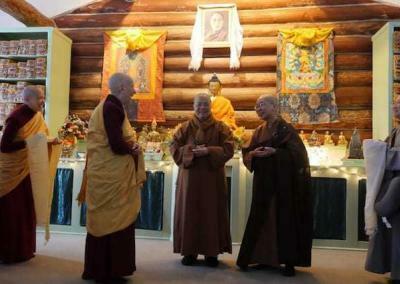 Western practitioners can learn much from the Asian lineages that have preserved them. 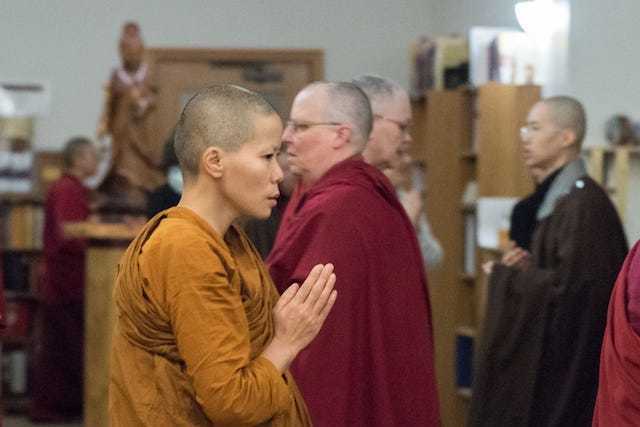 In particular, Buddhist monasticism is little known or understood in the West, and the Vinaya teachings have not been widely translated or disseminated. 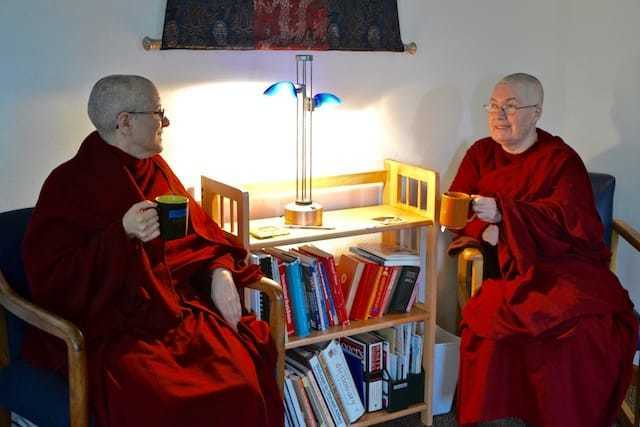 The Vinaya includes guidance on everything from how to handle monastery resources to methods for resolving disputes. 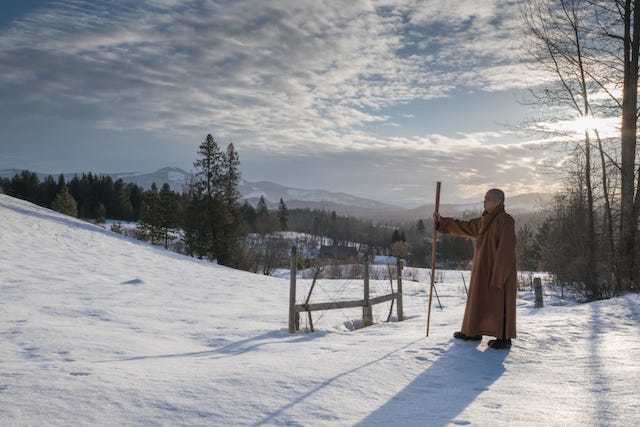 Venerable Master Wuyin covered some of essential monastic precepts by focusing on the origin stories. 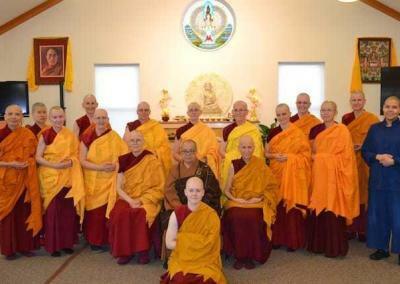 Every precept the Buddha established came as a result of a specific mistaken action done by a monk or a nun. 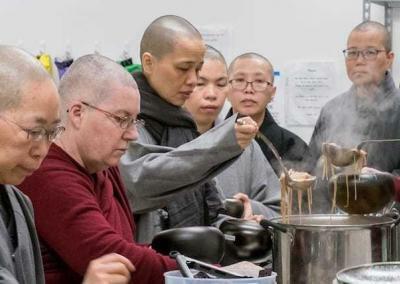 By studying the events—which range from horrific to humorous—that lie behind each precept, we get an idea about which mental afflictions the Buddha was targeting. 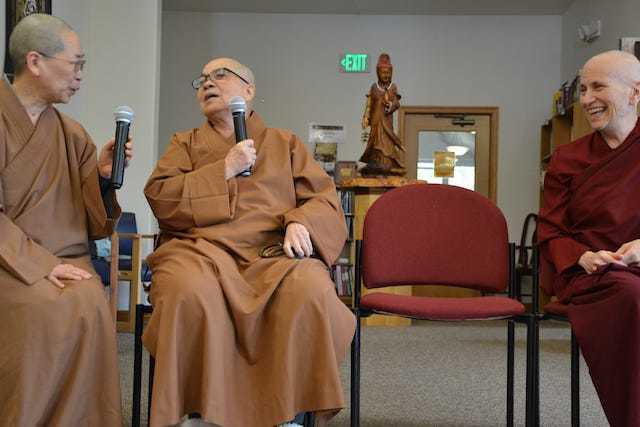 Venerable Master Wuyin presented a vast, practical vision. 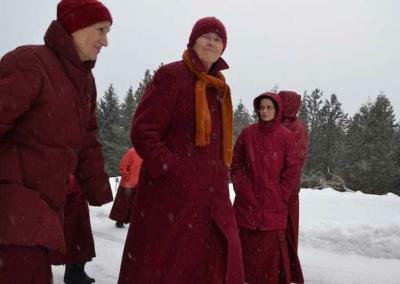 She emphasized that monastics in the West have to understand both the proscribed (prohibited) and prescribed activities for the sangha and then adapt them to suit Western culture—while keeping their original essence. 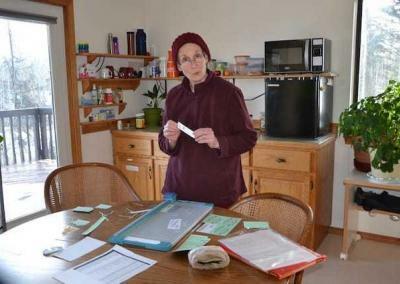 She stressed that we must know and follow the laws of the land regarding non-profit organizations, construction, and so on. 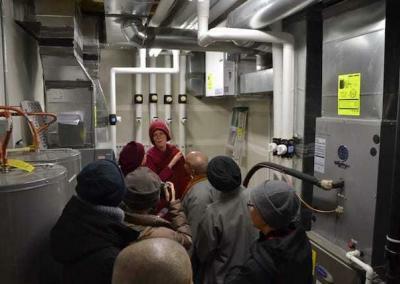 Master Wuyin also emphasized the role monastics must play in modern society by being of service to others. 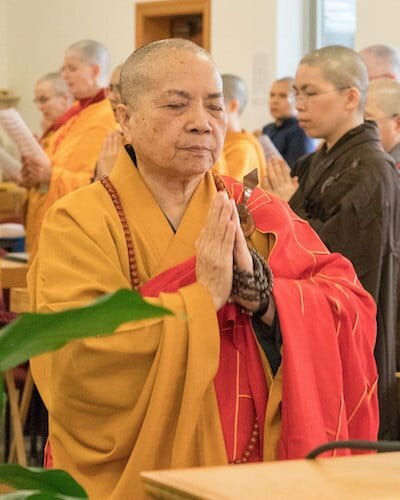 The bhiksunis in Taiwan are highly respected by both the laypeople and the monks because of the service they offer to society by teaching the Dharma and their involvement in social welfare activities. 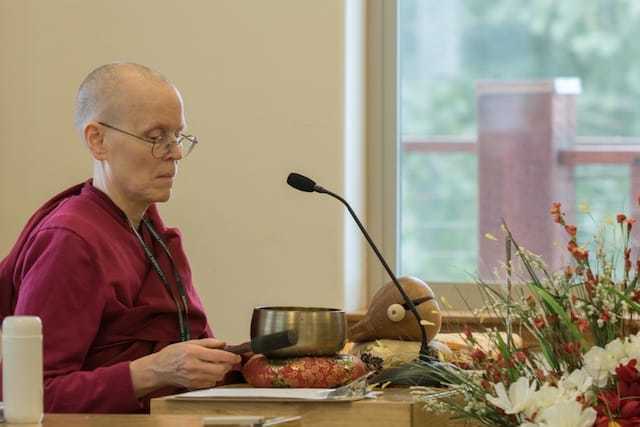 Her comments, along with talks from several other nuns, are on the Sravasti Abbey YouTube channel. 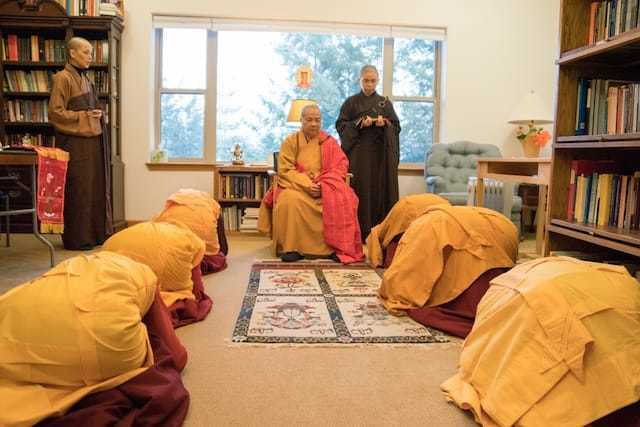 Master Wuyin emphasized that the Vinaya teachings must be lived to be understood. Through teachings, video, discussion groups, skits, and games, the LIBS bhiksunis brought the Vinaya alive for all of us. 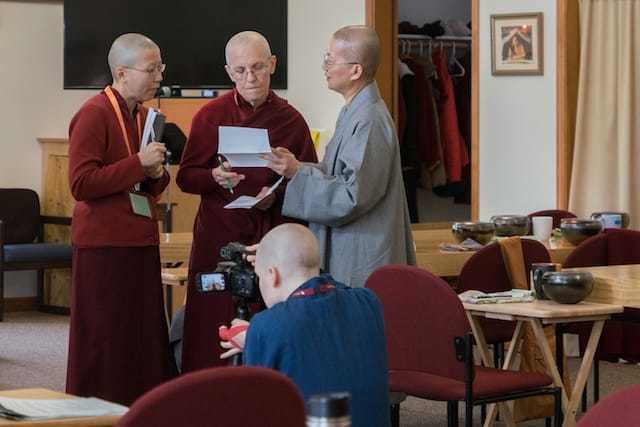 An especially skillful teaching tool, the skits were creative and hilarious, bringing out many points to contemplate that would not necessarily be brought up in regular conversation. 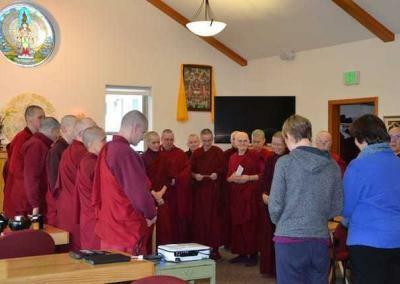 Just in the 17-day program we experienced so many of the things we studied. 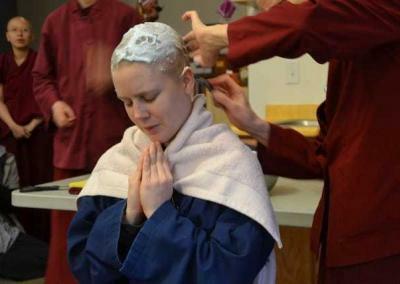 We did posadha together, witnessed a head-shaving ceremony, conducted a novice ordination, lived together as a community, confessed our shortcomings and rejoiced in each other’s virtue. 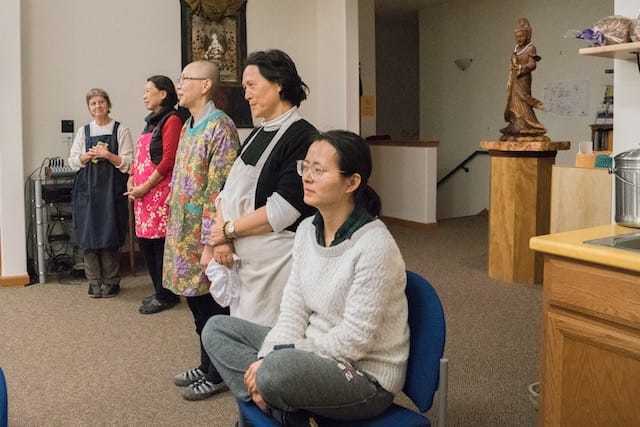 We chanted together—our voices mingling and complementing each other as we chanted age-old verses—some in Asian languages, others in English. 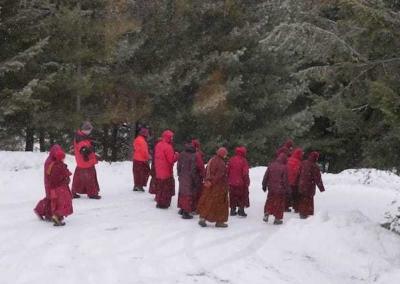 We supported one another as we all put joyous effort into practicing the path. 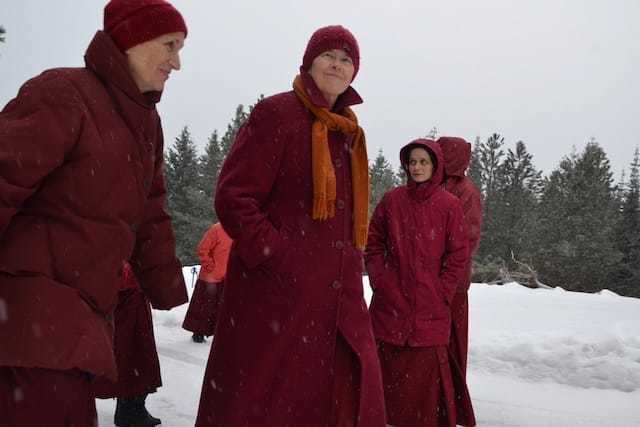 In the Mahaparinibbana Sutta, the Buddha emphasized the importance of the four-fold assembly—male and female lay Buddhist practitioners and male and female Buddhist monastics. 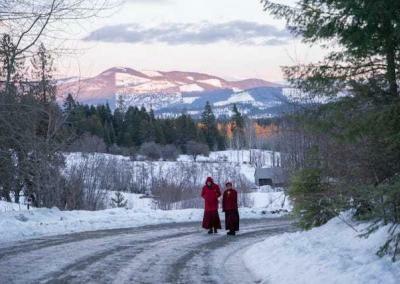 All have a responsibility to “walk in the path of the Dharma,” and all are necessary for the teachings to survive and thrive. 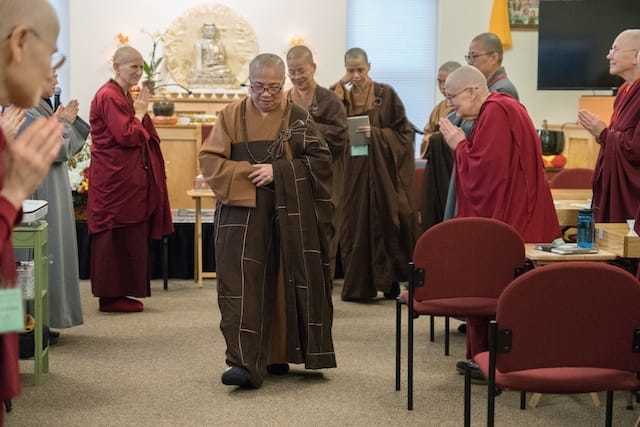 With over 1.2 million Buddhists in the USA (according to a 2012 Pew Charitable Trust report), the Buddha’s teachings to alleviate suffering and bring happiness are clearly taking root here. 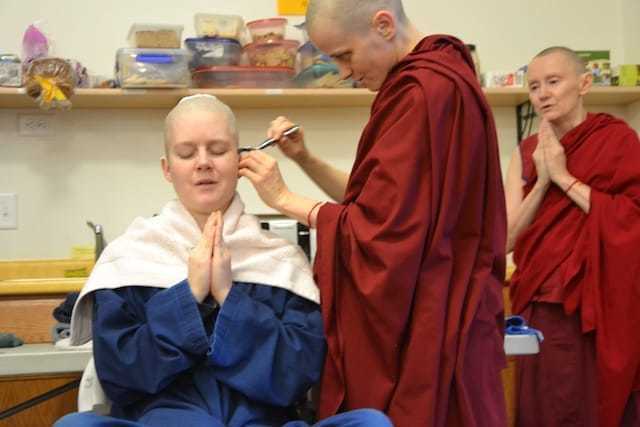 Sravasti Abbey is encouraged that support for Buddhist monasticism is also growing. 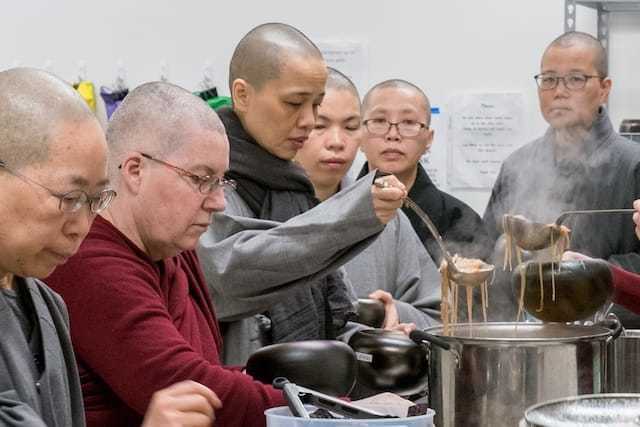 We rejoice in the growing monastic communities in the West, and offer tremendous gratitude to our teachers in the Taiwanese and Tibetan Buddhist communities who have helped us learn and grow. 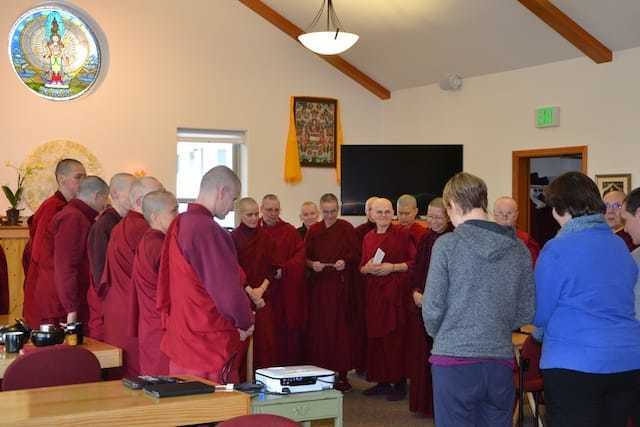 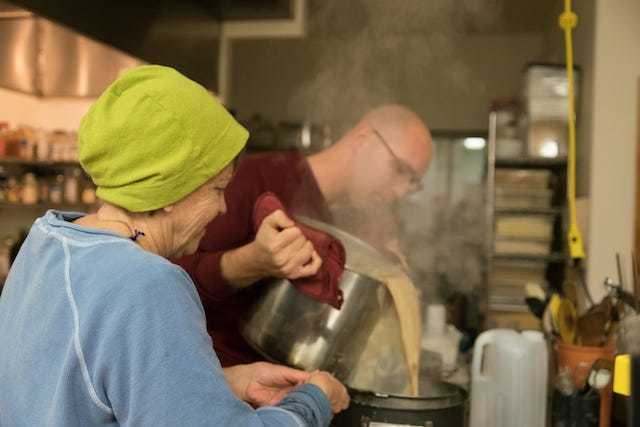 The Abbey hosted “Living Vinaya in the West” free of charge. 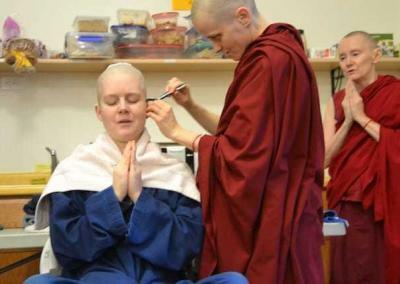 We were able to do this due to the generosity of people across the globe. 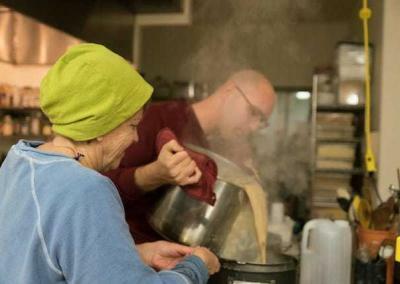 In addition, forty local volunteers supported the program by cooking, driving, cleaning, and running errands. This meritorious event could not have happened without their kindness and enthusiasm. 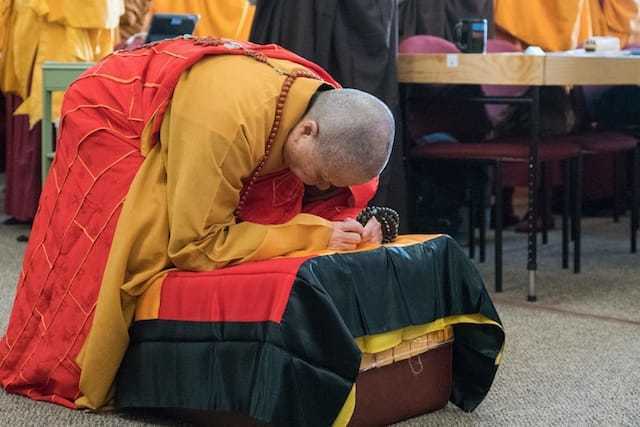 We are very grateful. 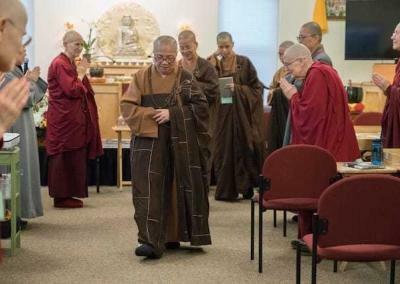 Venerable Master Wuyin promised to return to Sravasti Abbey to encourage our monastic efforts to preserve the Vinaya and the Dharma and serve society. 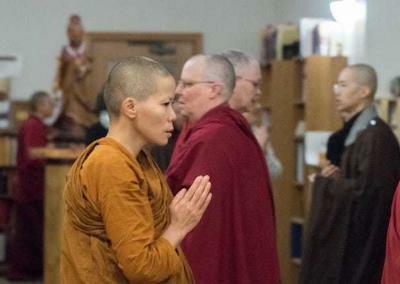 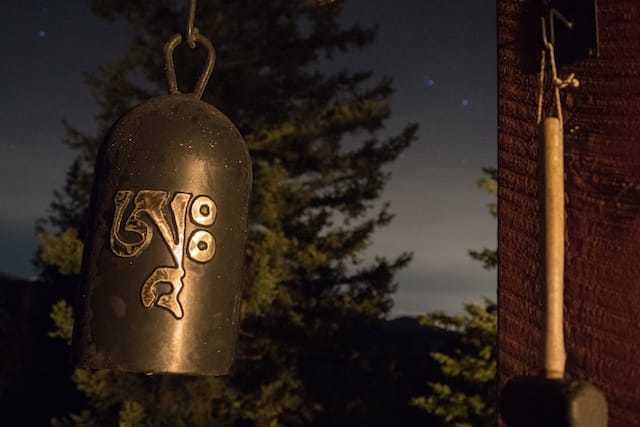 As we witness the discord prevalent in American public discourse, we rejoice at learning ways monastics can be more effective in bringing Buddha’s teachings on love, compassion, and wisdom to all who can hear them. The establishment of Sravasti Abbey embodies the paragon of Mahaprajapati Gautami’s spirit. 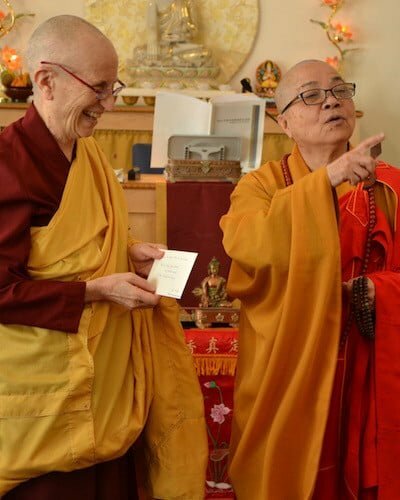 As long as the harmonious saṅgha upholds the Vinaya [concentration and bodhicitta], the brilliant lamp of wisdom will be sustained. 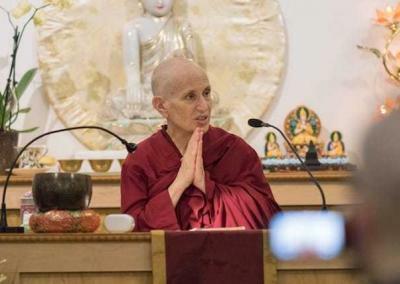 Vinaya Course Report from Taiwan, reflections by Dharma Drum Mountain’s Bhikihuni Changshen. 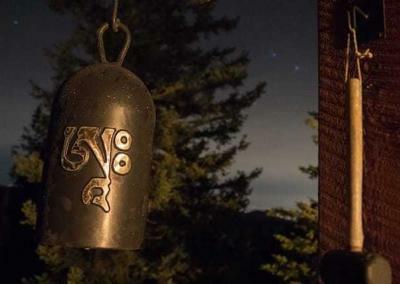 Original Chinese version. 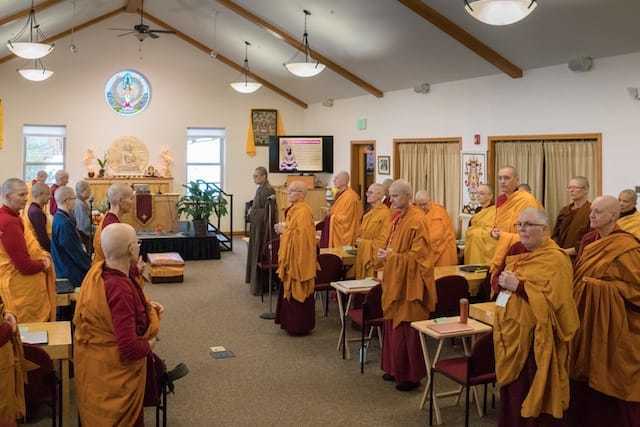 Book of the Discipline by I.B. 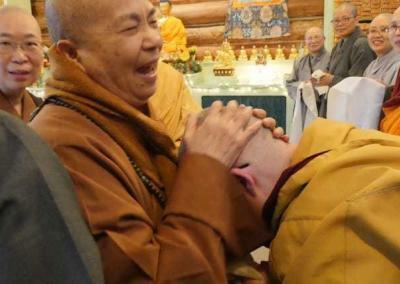 Horner. 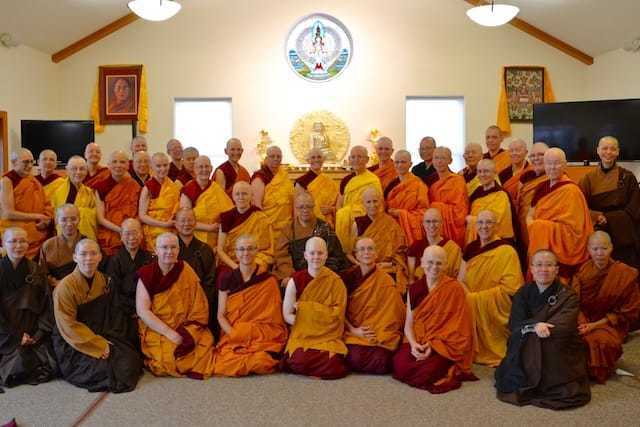 Download the complete text. 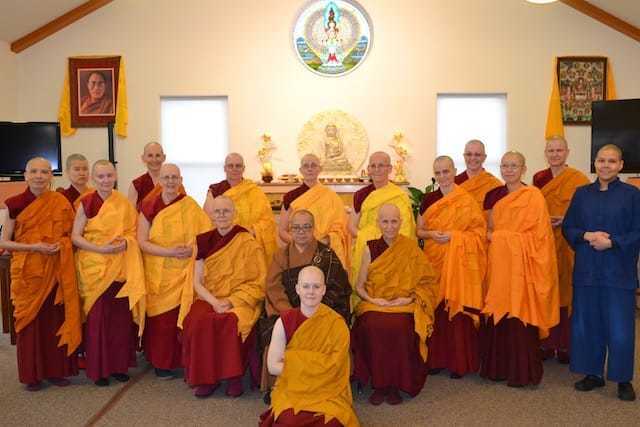 The Dhamaguptaka Vinaya Skandhakas in English are here.